"Toby," the original Learned Pig and the subject of my novel, Pyg, had in his day to contend with a number of porcine rivals, among them another English pig of the same name, a French cochon savant, and even an automaton pig, a thing of cogs and springs that could never complain about a harsh master or foolish questions. The tradition of such pigs extended well through the nineteenth century, as a search of historical newspapers readily demonstrates; we've already mentioned Mr Pinchbeck in these pages, but there were a host of others. Mr. James L. Hazard, whose handbill is shown here, appeared in several towns in New England around 1839; little else is known of him. In 1843, a Learned Pig was exhibited in Toronto; this one specialized in card tricks, which he performed, by one account, "with a precision and quickness that would do honor to an Egyptian magician." He also was able to spell "even the abstruse and obsolete words," a sign that his learning was not merely a matter of rote. 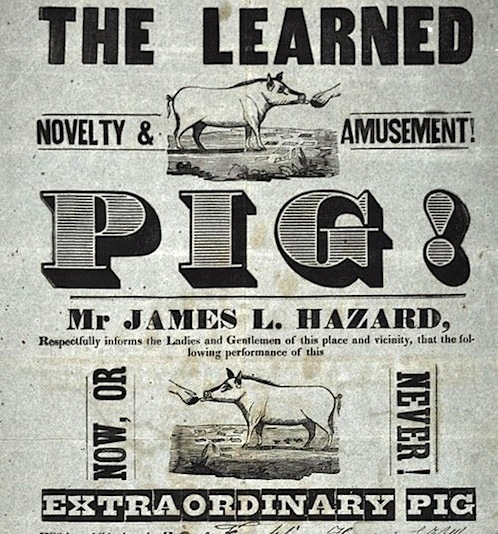 In Cleveland, Ohio, the city of my birth, an advertisement for a Learned Pig to be shown at Doan's Corners (now the intersection of Euclid Ave. and East 107th street) appeared in 1848. The advertisement contained so many errors of spelling and grammar that it elicited widespread scorn, with a writer for the Sandusky Register giving it as his opinion that "if the pig is not more 'learned' than his master, he is no great shakes." The great majority of these pigs took the name of their illustrious forebear, but there were some exceptions of note; a pig shown in Richmond, Virginia in 1870 was known as "Wicked Ben"; an especially sagacious pig in New Orleans in 1849 was called "Lord Byron," and a pig shown in Kalamazoo in 1884 was dubbed "Jumbo," a name perhaps consciously designed to echo that of P.T. Barnum's famous elephant, who was still alive at the time. 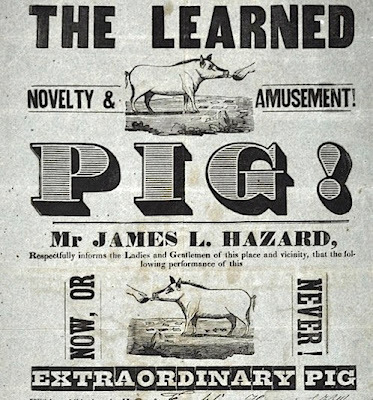 Their acts all had similar elements -- spelling out of words, telling the time, and so forth, with a few variations: a pig shown in New York in 1872 was said to excel at euchre, a feat which elicited "great applause from the brokers and bankers of Wall and Broad Streets, who find a pleasant relaxation from financial cares in witnessing piggy's antics." A few years previous, a gambling pig appeared on Broadway, which "learned grunter" was said to have won $250 from his unlucky human opponent. The act seems finally to have faded from popularity in the early twentieth century, with a few scattered exceptions, many of which were attached to cheap "dime museums" that appeared at country fairs. One of these, operated by man calling himself "Professor Worth," which appeared at a number of venues in and around Coney Island early in the century, included a learned pig among its attractions, but his show ended with the professor's death in 1917. After that date, nearly all the references to the Learned Pig are articles about long-past exhibitions, or punch-lines for poor jokes (e.g. "Which pigs are paid a salary? Those who are sty-penned!"). It's a loss not to be lamented, I fear, as Toby's own story illustrates; many, doubtless, were the cruel masters, and few the kind, and aside from Toby no other creature seems to have managed to free himself from being exhibited to the public as a "freak of nature."